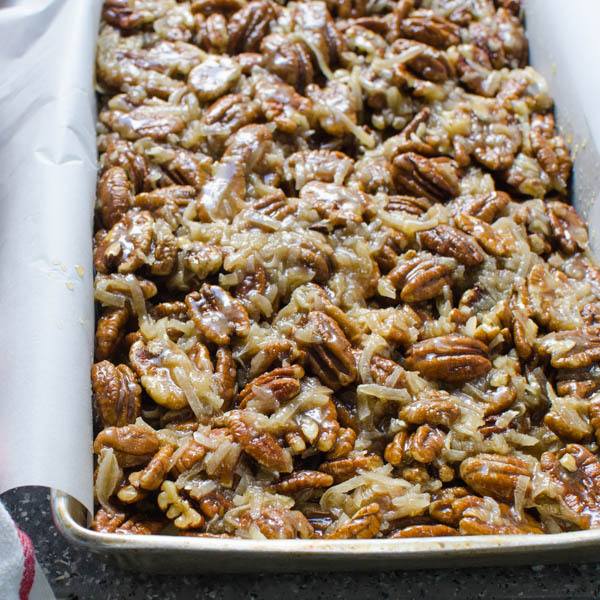 I should warn you right now that if you’re trying to “be good” these Salted Coconut Pecan Bars will have you slipping off that wagon in no time. They are the perfect sweet, salty, buttery, crunchy, chewy, caramel-y bites of dessert bliss on the planet. I wish that were an exaggeration. In fact, I wish I had a modicum of self-control, but the second these came out of the oven, I knew I was done for. 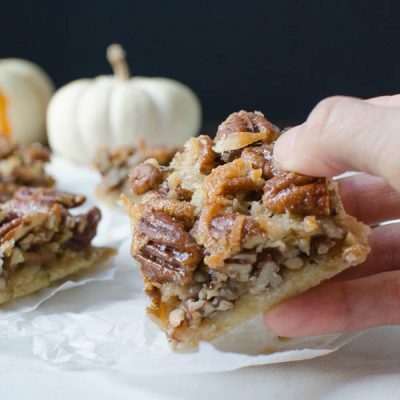 This recipe is based on the Pecan Bars from The America’s Test Kitchen Cookbook and it starts with a buttery shortbread crust. One that uses melted butter and a wooden spoon, followed by your clean hands to bring it all together. Press the crust into a parchment lined pan and set it aside while you prep the filling. 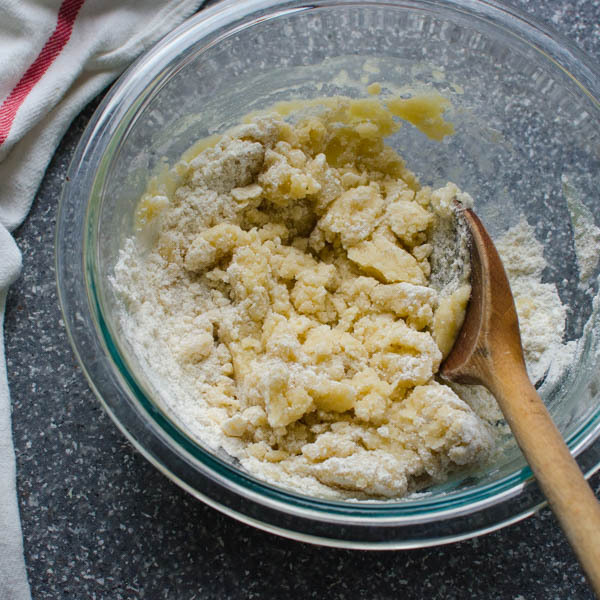 More melted butter, brown sugar, corn syrup and salt create a glaze that binds the rest of the ingredients to the shortbread. 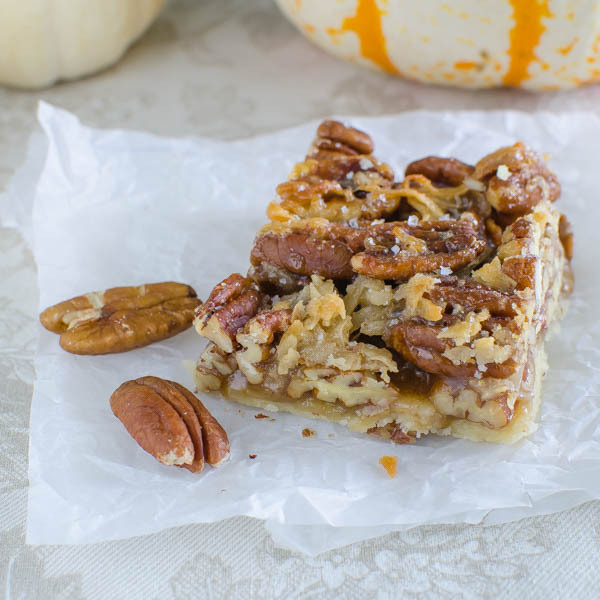 Sweetened coconut flakes add a chewy component to these bars, but the key to this recipe is the toasted pecans. Pre-toasting them gives them more crunch and flavor than if they were only baked once, so don’t skip that step. Evenly spread the pecan mixture over the crust and bake. My oven tends to be hotter in the back than in the front — a design flaw that I discovered when I realized my oven didn’t have an on-off switch for the lightbulb in the back. Consequently, I turned the pan 180° about halfway through the cooking time to get an even doneness. If your oven has hot spots, I recommend the same technique for you. As soon as the bars come out of the oven, sprinkle them with a half teaspoon of sea salt (not regular or kosher salt). I realize there’s not a shy amount of salt in the crust, filling and on top, but I assure you, it’s not too salty — in fact, it’s a perfectly addictive blend of salty and sweet. 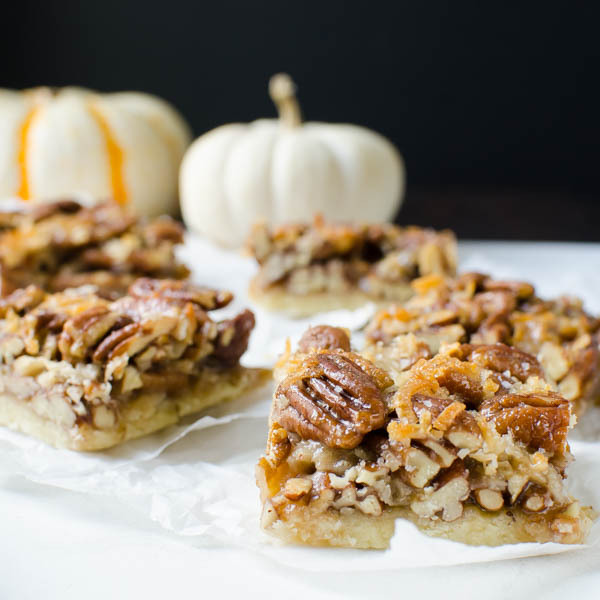 Let the bars cool to room temperature before cutting them into squares. 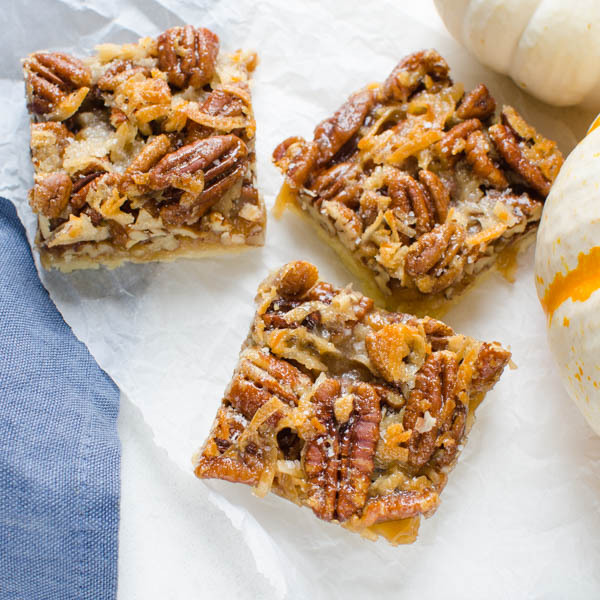 A crunchy, gooey, salty, sweet bar with a buttery crust. Preheat the oven to 350°. 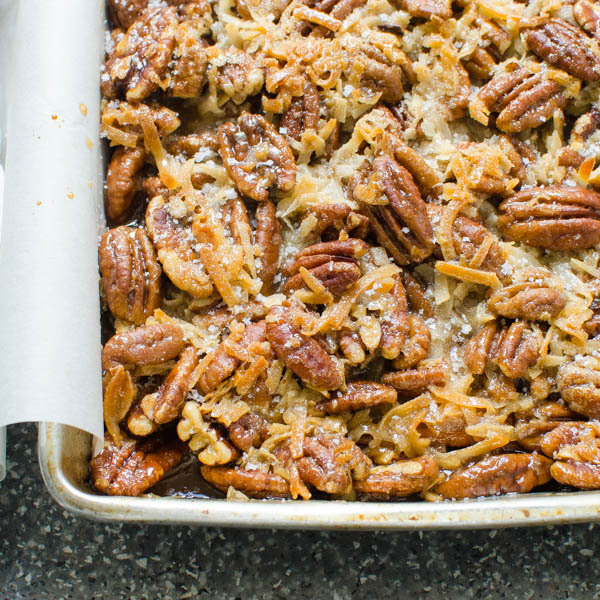 Place pecans on a baking sheet and roast for 8-10 minutes or until toasted and fragrant. Set aside. 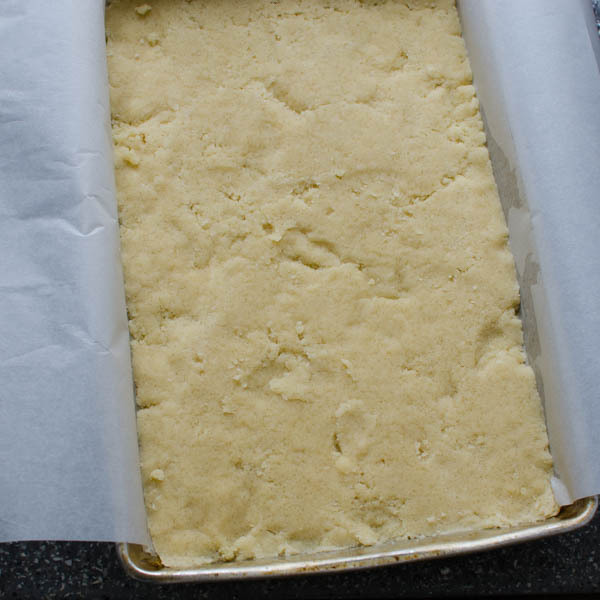 Cut parchment paper to fit the bottom of an 11x7 rimmed baking pan allowing for 3-4 inches of overhang on each side. Spray the bottom and sides of the pan with vegetable spray and lay the parchment in the pan, to create a sling. Spray the parchment paper with vegetable spray and set aside. 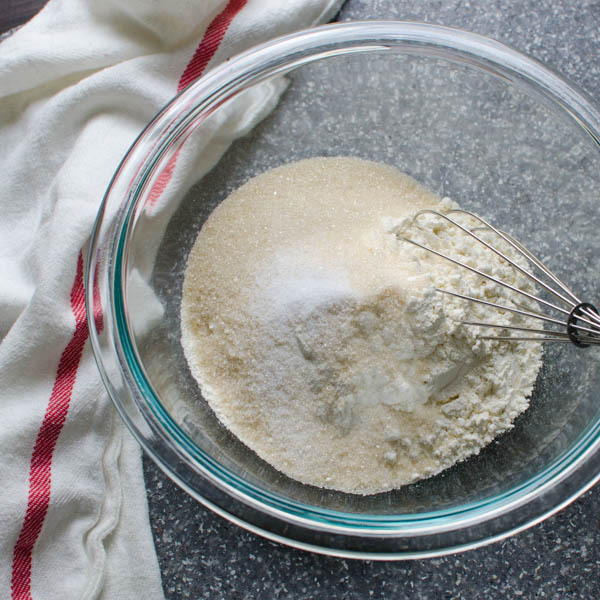 In a small bowl, combine the flour sugar and salt and whisk. 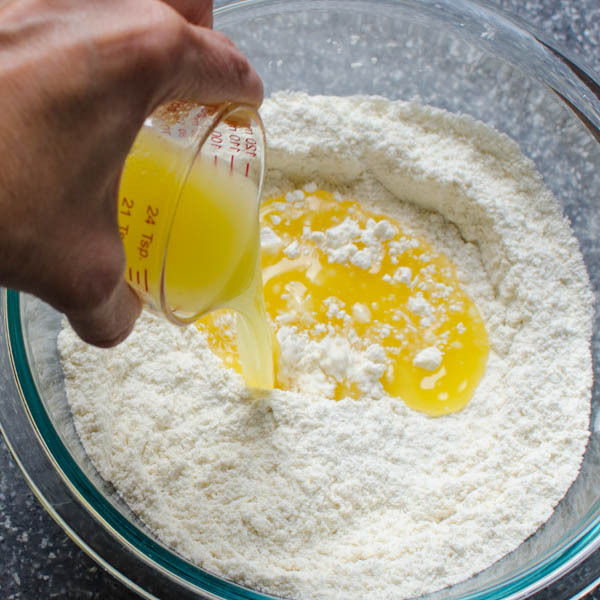 Stir in the melted butter until it becomes hard to stir, then use your clean hands to finish combining the ingredients. With your fingertips, press the dough evenly into the bottom of the prepared pan. Set aside. 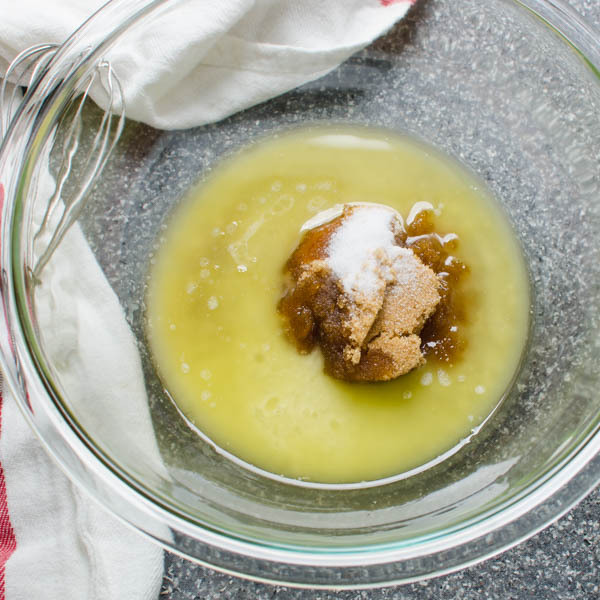 In a medium bowl, combine the brown sugar, corn syrup, melted butter, vanilla and salt and mix together with a spatula. Add the coconut and pecans and stir to combine. 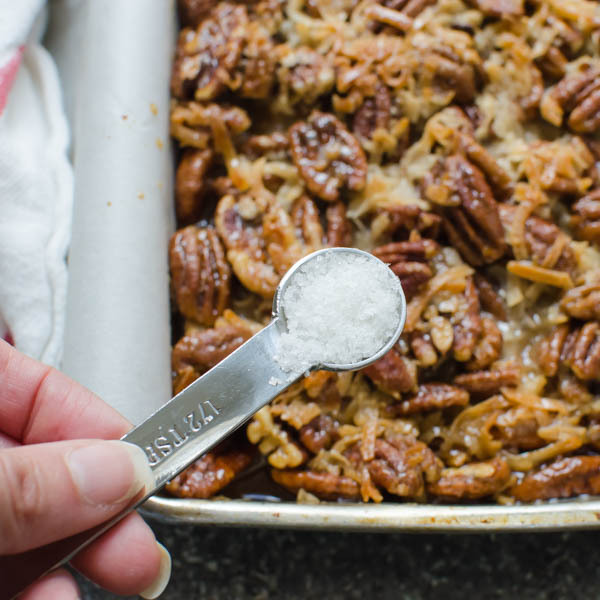 Pour the pecan mixture into the prepared pan and spread evenly in the pan. 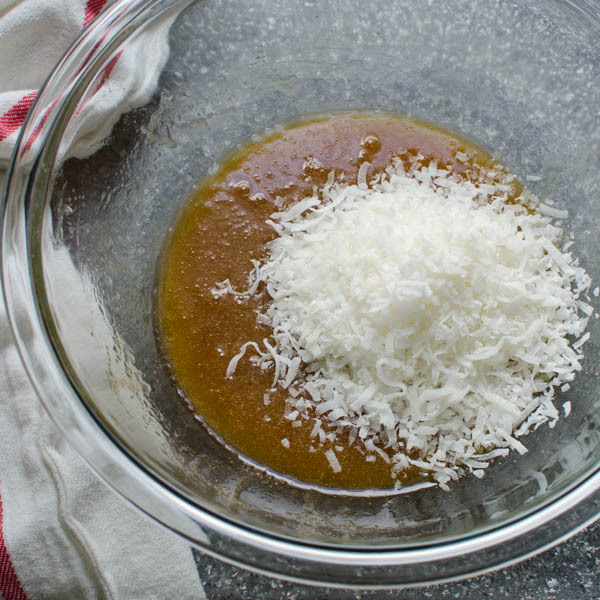 Bake for 20-25 minutes or until filling is bubbly and coconut is well toasted. Sprinkle evenly with remaining sea salt. Let the bars cool to room temperature, then carefully lift the bars from the pan and transfer to a cutting board. Using a very sharp knife, slice into 15 bars. Transfer to a platter to serve or stack in an airtight container, layering a piece of parchment paper between the bars to prevent sticking. Don’t Forget To “Pin It For Later! Oh my word! 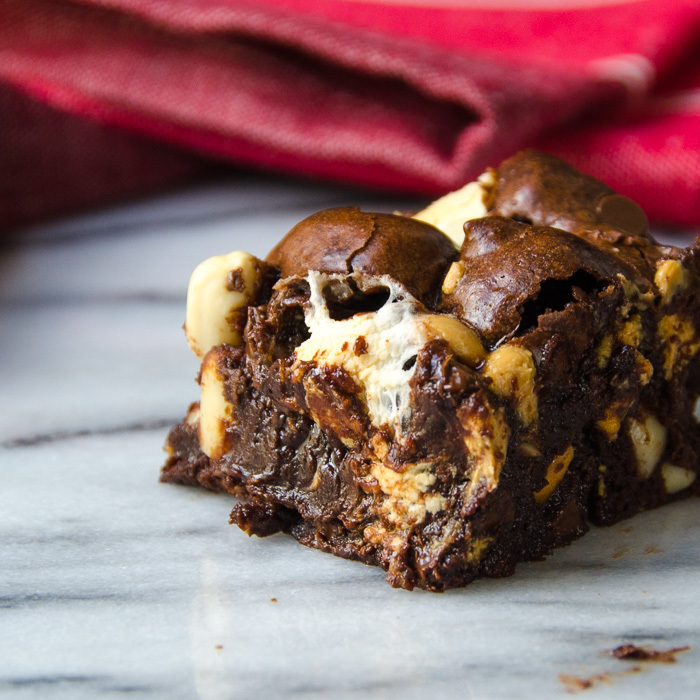 I have no words – your photos leave me in a puddle of drool – these bars are insane! Insanely delicious! I don’t think I’d be sharing these with anyone! These look just divine! And, isn’t there something just special about the combination of salty and sweet? Perfect in every way. Your step-by-step pics are really helpful. This recipe looks great and I can tell right away that I want to make this from your pictures. This looks easy and amazing, I’m in! Thank you so much! Let me know how you like them! Lisa, these bars are heavenly! 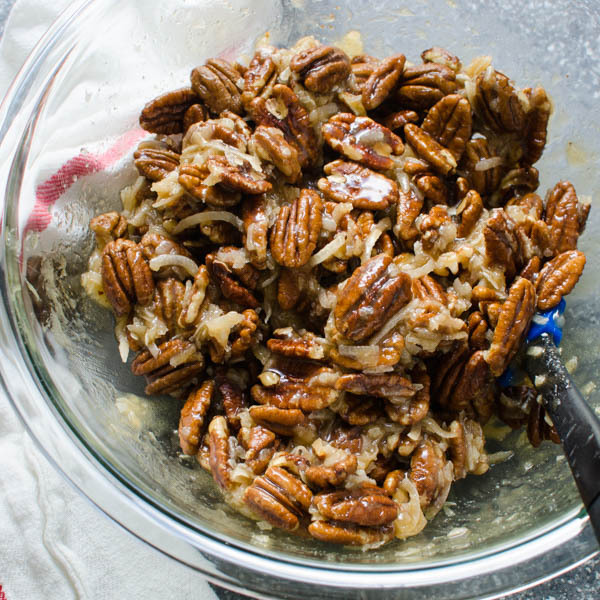 I love anything pecan and this is the time of the year I have no shame in baking pecan treats like, 5 times a day! So this one is going to happen soon and I know we are going to love it! 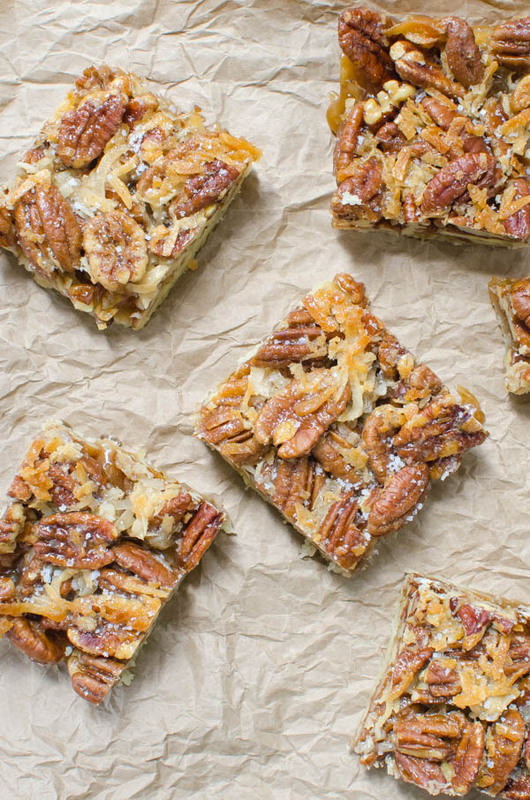 The key to these bars is the layers of salt — it gives them a fantastic balance of flavors!